A model o the atomic nucleus shawin it as a compact bundle o the twa types o nucleons: protons (reid) an neutrons (blue). In this diagram, protons an neutrons leuk lik little baws stuck thegither, but an actual nucleus (as unnerstuid bi modren nuclear pheesics) cannae be explained lik this, but anly bi uisin quantum mechanics. In a nucleus which occupies a certaint energy level (for ensaumple, the grund state), each nucleon haes multiple locations at ance. 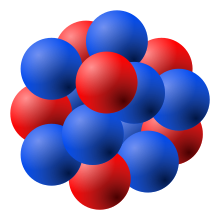 The nucleus is the very dense region consistin o protons an neutrons at the centre o an atom. It wis discovered in 1911 as a result o Ernest Rutherford's interpretation o the 1909 Geiger–Marsden gowd foil experiment performed bi Hans Geiger an Ernest Marsden unner Rutherford's direction. The proton–neutron model o nucleus wis proponed bi Dmitry Ivanenko in 1932. Almaist aw o the mass o an atom is locatit in the nucleus, wi a very smaa contreibution frae the electron clood.